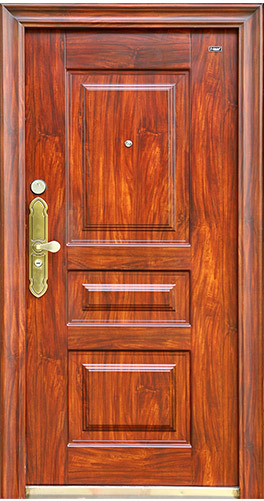 The unmatched strength of the body made of high quality Galvanised Steel and State-of-Art technology with unique features like multi-point, multi-position lever locking system, unique finish, non duplicable key, installation accessories etc and hence are very easy to install.The sturdy doors are supported by four sets of heavy duty invisible bearing hinges and user friendly wide peep hole, door bell etc. They provide perfect protection and peace of mind. GI Steel doors are created out of high quality galvanised steel with several unique features. The leaf of the doors are thick, structured with two side panel and rock wool/ honey comb material stuffing in between. These doors are finished in eye-catching wooden textures with durable special Matt Finish Heat Transmission Painting Technology (MHTPT), with colour guard treatment. Multi point , multi position, single key operated lever locks.